Melbourne legends, Kult Kyss are back with their phenomenal sound with the release of ‘EKKO’. We caught up with Haxx and Rromarin the pair behind the Kult Kyss project to reflect on their development, 2018 tour with The Presets, releasing ‘EKKO’ on the Risqué label, plus more. Futuremag Music: How has your approach to music developed over the last year? Kult Kyss: Over the last 12 months our approach to music has mostly developed in relation to our live show; we’re now writing with live performance in mind, and the kind of live act that we want to be. In general we're trying to write better songs, while pushing boundaries with our sound and vision for the project. Futuremag Music: What was it like touring with the Presets this year on their national tour? Kult Kyss: Touring with The Presets was incredible. They’re such caring, supportive human beings and we’re honoured to have joined them on their tour. It was a surreal experience to perform our first live shows across Australia in venues like Enmore Theatre and The Forum. A big learning curve and something we’ll never forget. ﻿Futuremag Music: Could you describe your signing to Risqué? How does working with a label differ from being an independent artist? 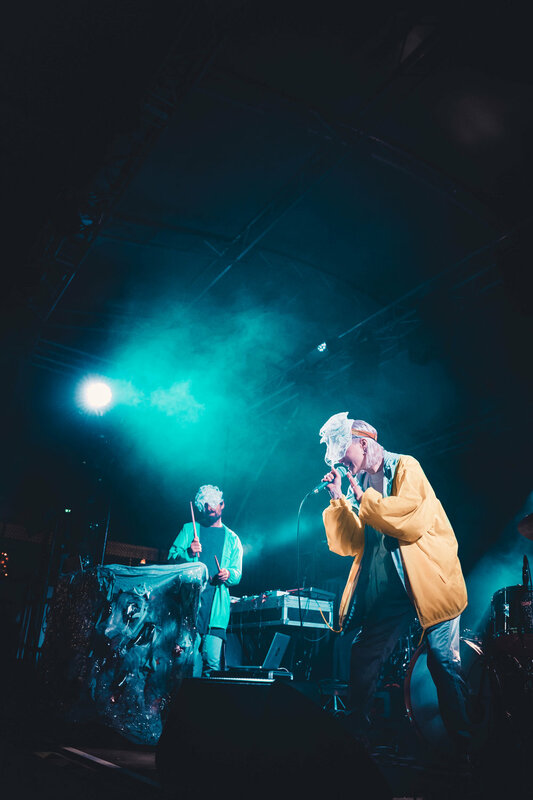 Kult Kyss: Signing to Risqué happened quite quickly and organically; Simon Lewicki reached out to us prior to BIGSOUND and organised to meet and see us perform live there. As soon as we met him in person we loved his energy and enthusiasm, and felt that he really understood our vision for Kult Kyss. We’ve only put out one track with Risqué but so far it differs in the amount of support and assistance we’re receiving, from admin, publicity, general advice and so on. Their drive and passion for the project has helped breathe new life into things and is allowing us to spend more time focussing on being creatives. Futuremag Music: What was it like being on ABC’s The Set? Can you tell us about that experience? Kult Kyss: Being on The Set was honestly the most crazy experience of our lives, simply because we’d never done anything like it, and it was like entering a whole other world. Walking onto the physical set and seeing how huge it was, the amount of detail they’d put in, plus all of the cameras and crew was a brain melting moment. It was so colourful and otherworldly, and quite overwhelming. With that said, everyone was so lovely, and it was run with such a high level of efficiency and professionalism that we were able to relax and focus on performing. It was great to finally meet Linda, as well as Dylan and the rest of the cast. And most of all, performing on stage with The Presets was the best moment. Futuremag Music: How does the creative process differ for remixes or reworks compared to producing original tracks? Kult Kyss: Remixes are usually much easier because the melodic content of the song is already created. Creating an instrumental around a pre-existing topline is usually more inspiring, and we often find that we get faster results. There are other considerations at play however, as it's important to keep a good remix structure in place so the DJ can easily bring it in and out when they mix. You also want to bring something special and unique to the forefront and put your own mark on the song. Futuremag Music: What’s the inspiration for the visuals and design work in your album art/ videos? How does this tie in with the music? Kult Kyss: We’ve always loved post-internet 3D art, and feel that the juxtaposition of this style with influences from the natural world really reflects the essence and identity of our sound. We love the fusion of organic vs synthetic components, both sonically and visually. In the case of EKKO, artist Edo Rafter of E+D wanted to try and capture the feel or visual embodiment of an echo ~ a sound travelling and morphing through space, splitting apart and shimmering away. We're lucky to work with some very gifted and unique visual artists who have helped us create a world for the music to exist in. Futuremag Music: What was the production process like for ‘EKKO’? Kult Kyss: ‘EKKO’ actually started as a completely different track that we performed live while on tour with The Presets - it used to be called ‘UV Silicon’ and had a totally different vocal topline. We liked it, but felt that we could explore it more and so decided to revisit and re-write it. The production changed a little, and the vocals underwent a complete transformation both lyrically and melodically. The beat was originally made up entirely of breaks from old records, and we spent quite a long time supplementing them with denser electronic textures so it still had a modern sound but retained the OG feel. The hardest part from a technical perspective was maintaining the size of the track without it seeming out of control. There is actually quite a lot going on in there, haha. Futuremag Music: What can fans expect in future releases? Kult Kyss: The project is currently undergoing a bit of a sonic shift ~ we’re exploring new sounds and ideas, new recording techniques and different approaches to our songwriting. People can expect music that goes deeper into the realm of electronic dance, with more personal lyrical narratives than we’ve had before.